Our two warehouses in Kent provide temperature controlled space for up to 4,000 pallets of fresh produce. Compartmental temperatures mean that a variety of produce can be kept at optimum temperatures for each individual produce type. Our 13 warehouse compartments currently range from -0.5 degrees to +8 degrees and can be changed, depending on the produce stored. 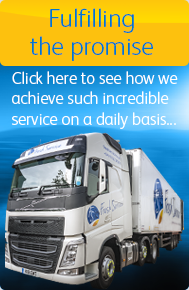 Our ‘stock’ service allows you to store your fresh produce for as long as you require and then instruct us on a daily basis on each pallets’ delivery points and distribution dates, depending on your customers’ requirements. This service allows you to plan and control your stock levels and liaise with customers, without physically storing the produce yourself. For groupage customers, our cross-docking facilities enable you to drop produce with us 24/7 for immediate re-distribution. Pallets can also be split or stored should your requirements change.